There’s a simple job needs doing in a simple town come November 4th, but there’s something red muddying the mix: demons. Ain’t it always the way? Welcome to the Weird West, situated on the supernatural frontier. Some residents wear horns instead of hats, and if the launch trailer is to be believed, some baddies belch blood. Perhaps most sinister of all is whatever temporal flux sees shootouts unfold by turns, with each combatant springing to life one after the other a la XCOM. Need more turn-based tactics to tide you over? These are the best strategy games on PC. You can pre-order on Steam, GOG or the Humble Store if you like: £14.99 / €19.99 / $19.99 nets you a standard version, and £18.99 / €24.99 / $24.99 adds a digital art book, comic and soundtrack – the latter by The Witcher 3’s Marcin Przybylowicz. 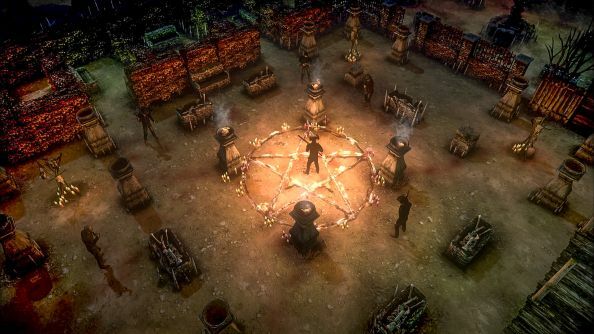 Hard West’s campaign totals 40 missions spread across eight story scenarios. You’ll control between one and four characters, and do that thing with an old gun where you click back the hammer lots of times to fire in quick succession. Expect to decide the outcome of several plot points, and probably walk off into the horizon at the end like a good Western Hero. In our look into the rise and fall of Space Hulk developers Full Control,Thomas Hentschel Lund described a weird industry coincidence that saw a few Old Western strategy games pitched to publishers at once. Hard West was the only survivor. This has been a bumper year for turn-based games, hasn’t it? Got time for this one?